Coleraine may have lost the game to Crusaders on Saturday but new keeper Chris Johns impressed on his debut for the Bannsiders. The former Southampton trainee put pen-to-paper on a short term deal at The Showgrounds last week. He came straight in to the starting line up on Saturday and impressed with a string of fine saves. 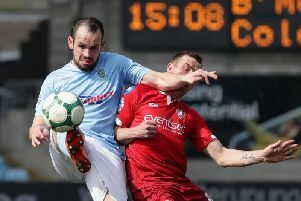 “It’s difficult enough to make your debut in the Irish League, but I think making your debut against Crusaders puts it up a notch again because you know they put an awful lot of balls into the box, and you know he’s going to be a busy man,” said boss Oran Kearney. “I think against some of the other teams who play in front of you he maybe would have had an easier day. Johns, son of former Ireland rugby international Paddy Johns, had been playing for Championship side Bangor for the first part of the season. Kearney is hopeful of keeping the keeper at Coleraine for the long term. “We are delighted to bring Chris in,” said Kearney. “There was a lot of interest in him from several other Premiership sides. “He has been training with us and has been very impressive in the sessions so far. “Chris has done his duty across the water, and a couple of English clubs were keen to sign him up in the summer but he decided to return home to further his studies. “He is initially signed until the end of the season but I would be hopeful to extend his stay here.